LUXOR CUSHION BOXES There are 3 products. 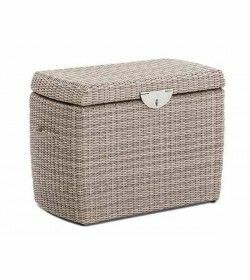 The marine grade synthetic rattan is specifically developed for outdoor use. It is tested for suitability across a wide range of outdoor temperatures, is colour-fast and has UV stabilisers added so the whole unit keeps that look like new appeal for longer. And cleaning is a cinch simply requiring a quick wipe down with a cloth periodically. This is a feature perhaps more suited to commercial buyers. Tough plastic feet are attached to the bottom four corners to raise the box off the ground slightly.